Ingredients: Fresh Aloe Vera Extract, Palm Oil, Coconut Oil, Mahua Oil, Lye and pure essential oils of Patchouli Oil, lavender Oil, Rosewood Oil. Benefits: It is Moisturizing, Rejuvenating, Healing and Softening for skin. Ingredients : Coconut Oil, Palm Oil, Mahua Oil, Lye and pure essential oils of Lemongrass Oil, Lavender Oil,Cedar wood Oil, Lemon Oil. Benefits: It is Antimicrobial, anti fungal and antiseptic, combats excessive perspiration and balances oily skin. Its refreshing aroma removes nervous exhaustion. Almond Rose: The pure Elixir of Youth from Nature. Ingredients - Olive Oil, Palm Oil, Coconut Oil, Mahua Oil, Lye,and pure essential oils of Rose Oil, Geranium Oil, Palmarosa Oil, Rosemary Oil, contains roasted and ground almonds. Benefits - It keeps the skin dew fresh and young looking, delays the appearance of wrinkles, blackheads, dryness and even pimples.. Ingredients : Olive Oil, Palm Oil, Coconut Oil, Mahua Oil, Lye, and pure essential oils of Rose Oil, Geranium Oil,Palmarosa Oil,Rosemary Oil and dried Rose Petals. Benefits: It serves as a natural cleanser, toner and moisturizer, fights ageing process of the skin, improves the texture of the skin by increasing its elasticity. Ingredients: Neem Oil,Palm Oil, Coconut Oil, Mahua Oil, Lye and pure essential oils of Basil Oil, Dill Oil, Nagarmotha Oil, Geranium Oil. Benefits : It is an excellent moisturizer, is high in Vitamin E, soothing to stressed skin, antidepressant, antibacterial and antifungal. Ingredients : Cocon﻿﻿ut Oil, Mahua Oil, Palm Oil, Lye, and pure essential oils of Patchouli Oil, lavender Oil, Ylang ylang Oil, Cedar wood Oil. Benefits : It has a deep musky exotic aroma, it is antiseptic and antiviral and a potent Aphrodisiac. Ingredients : Organic Coconut Oil, Organic Mahua Oil, Palm Oil, Lye and pure essential oils of Sandalwood, Vetivar, Rosewood and Cedarwood. Benefits : Antiseptic, Astringent,Emollient, Cooling, helps removing scars, helps maintain good health of nerves, brings relaxation. Ingredients : Palm Oil, Organic Coconut Oil, Castor Oil, Organic Mahua Oil, Lye, Purified Water, dried orange peel powder, Pure Essential Oils of Orange, Patchouli, Eucalyptus, Clary Sage and genuine care. Ingredients : Palm Oil, Organic Coconut Oil, Castor Oil, Organic Mahua Oil, Lye, Purified Water, herbs of Khadira and Manjishtha, Pure Essential Oils of Lemon Oil, Grapefruit Oil, Patchouli Oil, Rosemary Oil, Orange Oil. 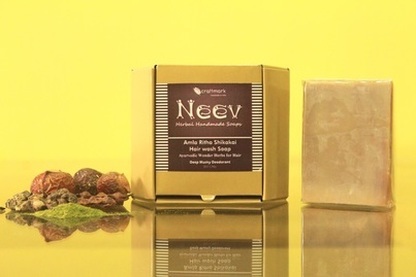 Benefits : Bath of khadira decoction is considered a panacea for various skin affection. It is most effective ayurvedic drug for skin detoxification. Manjishtha also detoxifies and purifies skin. Grapefruit Oil detoxifies, Rosemary Oil has antibacterial and antimicrobial properties, Lemon Oil cleans toxins, patchouli oil is antiseptic and antiviral. Ingredients : Palm Oil, Organic Coconut Oil, Castor Oil, Organic Mahua Oil, Organic Sesame Oil, Almond Oil, Wheatgerm Oil, Lye, Purified Water, herbs of anantmool, nagkesar and kumud; Pure Kashmiri Saffron, Pure Essential Oils of Sandalwood, Vetiver, Rosewood and Cedarwoood and genuine care. 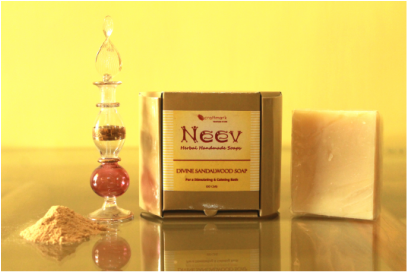 Benefits : Nagkesar brings fairness and firmness to skin, Kumud tones the skin, wheat germ oil fights aging of the skin and promotes skin health by improving blood circulation; Saffron imparts smoothness and brings glow to the skin; Sesame oil is naturally antibacterial and antiviral, almond oil is softening and calming. Recommended for all skin types. Ingredients : Palm Oil, Organic Coconut Oil, Castor Oil, Organic Mahua Oil, Lye, Purified Water, dried cucumber powder, Pure Essential Oils of, Teatree, Lemon, Rosewood and Clary Sage. Benefits : Cucumber reduces wrinkles, revitalizes skin, reverses tan, reduces fine lines and blemishes, teatree oil treats acne, warts and corns, lemon oil rejevenates skin and cleans toxins, rosewood is a natural deodorant. Benefits : Herbal Soap to wash off face. It improves skin complexion and texture, relieves blemishes, acne, scars and black heads, has anti ageing qualities. per ayurvedic recipe of Kumkumadi oil; Palm Oil, Castor Oil, Organic Coconut Oil, Organic Mahua Oil, Pure Kashmiri Saffron, Powdered Vetiver, Powdered Almond, Fresh Aloevera gel, Camphor, Purified Water, Lye, Pure Essential Oils of Jasmine, Vetiver, Peppermint, Sandalwood, Rosewood. Benefits : Patchouli Oil soothes inflammation,is antiseptic, a natural aphrodasiac, prevents sagging skin. Teatree Oil promotes removal of toxins, prevents occurace of acne, oats absorb and remove oil and bacteria from skin. Drumstickis very beneficial for the hair and scalp as it has many vitamins and minerals. It cleanses the hair and scalp, prevents hair damage, dandruff, dry and lifeless hair. It also increase blood circulation of the scalp and boosts hair growth. As the blood circulation increases, hair follicles get more nutrients, leading to strong and healthy hair. Ingredients : Palm Oil, Organic Coconut Oil, Castor Oil, Organic Mahua Oil, Lye, Purified Water, herbs of amla, reetha, shikakai, neem, brahmi, bhringraj, Pure Essential Oils of Lavender, Rosemary, Lemon and Geranium. Ingredients: Palm Oil, Organic Coconut Oil, Sesame Oil, Organic Mahua Oil, Lye, Purified Water, Dried and powdered pods and leaves of moringa(drumstick), Pure Essential Oils of Vetiver, Bergamot, Jasmine, Cedarwood and Orange Oil. Benefits : ﻿﻿Moringa is known as a " miracle tree". It has many therapeutic and skin purifying properties. It rejuvenates the skin and enhances fairness. It detoxifies and cleanses. It is rich in antioxidants and promotes healthy skin cells.The Vetiver Oil has a pleasant, earthy and musky smell with cooling effiect on mind and body.